43 x 53 mm titanium case Pilot Line shape, scratch-resistant sapphire crystal with anti-reflective treatment on both sides, black dial,thermo-compensated multi-functional quartz Omega 5666 movement with dedicated pilot functions, analog hands, LCD windows display, time, UTC, chronograph, alarm, perpetual calendar, function menu, approximately 24 months of power reserve, titanium bracelet. Water resistant to 30 m.
43 x 53 mm titanium case Pilot Line shape, scratch-resistant sapphire crystal with anti-reflective treatment on both sides, black dial, thermo-compensated multi-functional quartz Omega 5666 movement with dedicated pilot functions, analog hands, LCD windows display, time, UTC, chronograph, alarm, perpetual calendar, function menu, approximately 24 months of power reserve, black rubber strap. 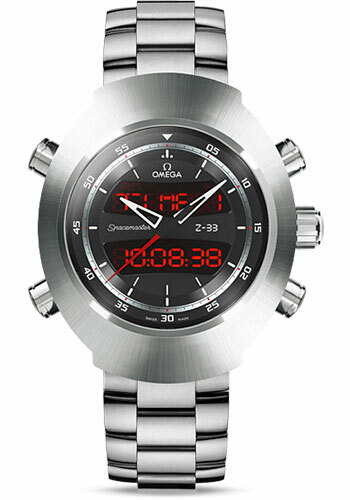 Water resistant to 30 m.
43 x 53 mm titanium case Pilot Line shape, scratch-resistant sapphire crystal with anti-reflective treatment on both sides, black dial, thermo-compensated multi-functional quartz Omega 5666 movement with dedicated pilot functions, analog hands, LCD windows display, time, UTC, chronograph, alarm, perpetual calendar, function menu, approximately 24 months of power reserve, brown leather strap. Water resistant to 30 m.